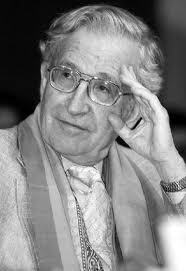 This brief interview with Noam Chomsky is reposted from Jan Wellman’s blog. The most bizarre part of Section 1021(b)(2) of the National Defense Authorization Act (NDAA) is that almost no one has heard about it. And whoever has heard about it, doesn’t want to talk about it. No one wants to hear about the military having the power to detain you on American soil, without due process, indefinitely, at the discretion of the President. It sounds too Stalin. It reeks of conspiracy theory. Besides, it’s clearly unconstitutional. So let’s go get some lunch. That’s why on December 4, 2012, the new NDAA passed the Senate with a 98-0 vote. Almost everyone was out at lunch. Except seven individuals who decided to sue Obama instead. But other than that, the resulting rumpus was minor. Since February 13th, “The Seven” are on their way to the Supreme Court. But no one wants to hear about it. A few individuals against the United States government sounds too Matthew McConaughey, unless you’re a natural-born activist. Chris Hedges, the leading plaintiff in the case against Obama and former New York Times war correspondent, writes about “NDAA and the Death of the Democratic State.” But no one wants to really read about it. Most aspiring journalists and independent minds who become curious about NDAA find that there is a deafening silence around the topic. When they try to raise questions, the silence deafens them further. Then there are the conspiracy buffs. They distance the problem from the main stream audience even further. No one wants to be associated with folks who think that the President could be a reptile. And then there is Noam Chomsky. He looks at the situation from the orbit, comfortably snug in his multidisciplinary mental space station, focusing on the connections between events – rather than the events themselves.